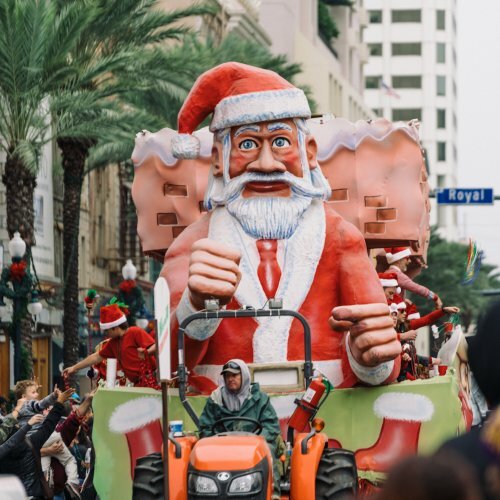 There’s lots about a December in New Orleans to get excited about. For some, the highlight is the timeless holiday decorations that illuminate the lobby of the Roosevelt Hotel. For others, it’s the ice skating rink in the Convention Center for NOLA ChristmasFest. It might be that loveable rock band of famous felines, the Acro-Cats, who return to Mew Orleans every year. But for the more than 50,000 people that have flocked to Lafayette Square each December for the past five years, there is nothing quite like LUNA Fête, the free and spectacular light show that is unmatched not just in our city, but across the country. 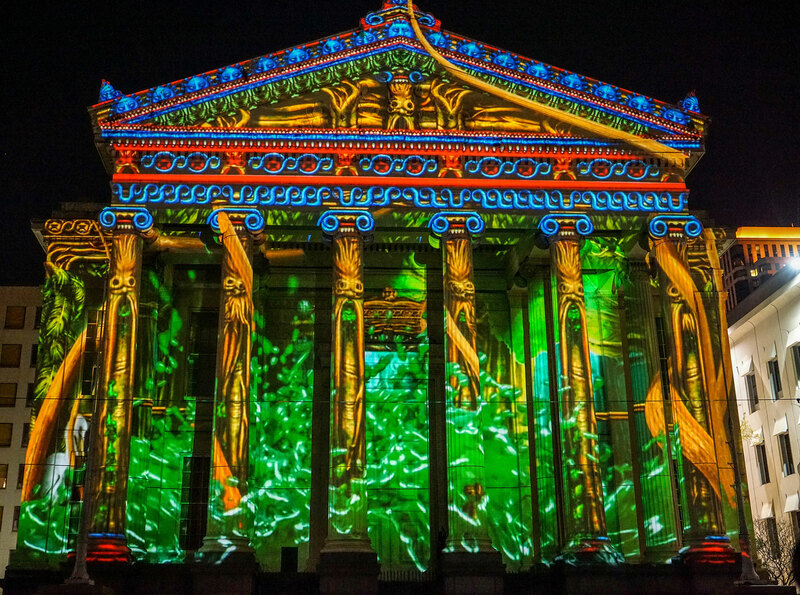 Since its inaugural year, projecting light-based art onto historic Gallier Hall has been the main event attraction most visitors associate with the festival. “When we first conceived of the event,” Glatz explained, “it was because we noticed three industries in New Orleans were taking off: film, technology, and contemporary art. They’re all creative by nature, but they weren’t interacting.” Watching the stories and images project onto Gallier’s façade shows how powerful the art can be when they do. 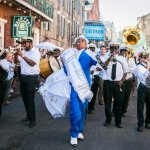 Arts Council New Orleans originally planned for LUNA Fête to be a five-year series, culminating during the Tricentennial. And, for that reason, this year Gallier Hall will be the canvas for not just one, but two shows: one by La Maison Productions from France, and the other by AVA from Mexico. The shows will alternate each hour, with one show beginning on the hour from 6 p.m. until 10 p.m. from Dec. 6 through 9. This year’s theme is “Through Time,” and both shows will celebrate the Tricentennial renovation of Gallier Hall by transforming the building’s façade with a retrospective of past artists’ work. 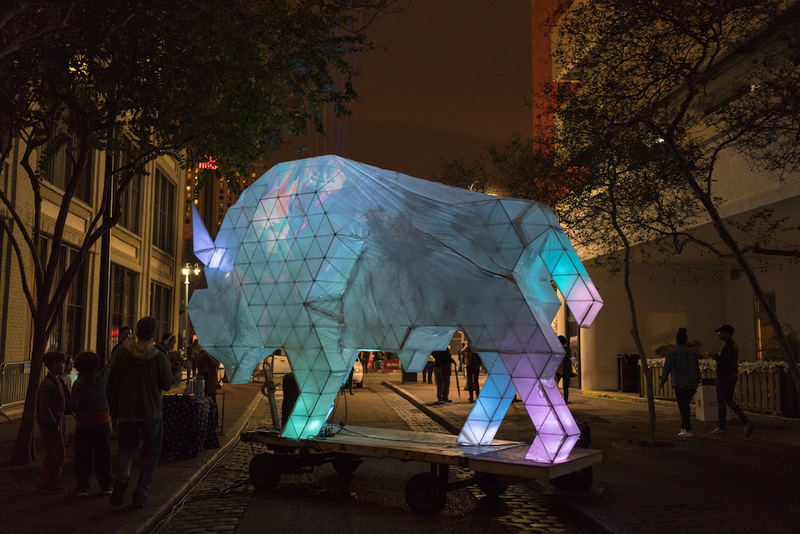 Similar to previous years, visitors can expect a magical laser show illuminating the night sky, an art market, as well as interactive installations and digital sculptures by local artists that line Lafayette Street and connect all the way to another local winter favorite: Miracle on Fulton Street. There are also a handful of new elements to enjoy at the festival this year. In Lafayette Square, you can experience LUNA Fête as a VIP by purchasing tickets to the LUNA Lounge for just $50 ($10 for children 12 and under). Access to the Lounge lets you watch the show under a heated tent, with private bathrooms and complementary food and drinks from some of the best restaurants in the city, like Cavan, Longway Tavern, Sylvain, Meauxbar, and Barrel Proof. There’s also the premiere of a satellite exhibition at the New Orleans Jazz Museum at the U.S Mint called “Sound Collage,” which will run from Dec. 5 through 7, from 5:30 p.m. until 10:30 p.m. each night. 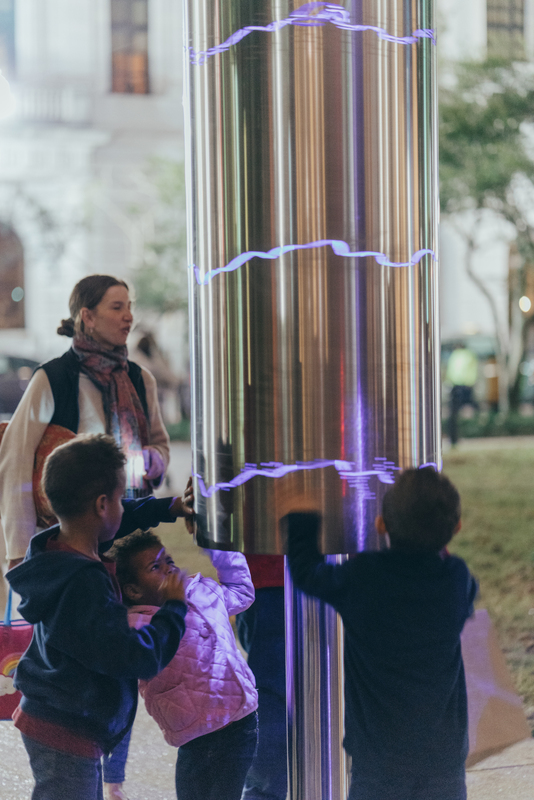 Like the main space in Lafayette Square, it’s free to the public and will include many of the experiences LUNA Fête attendees have come to love: live music, projection mapping, an arts market, and illuminated installations. Glatz suggests it might take two nights to experience all that LUNA Fête has to offer this year. “We’ll be showing four of the 13 numbers from the Opera,” explained the spokesperson, “and you can check out the trailer here.” The full Opera premiers this Mardi Gras. “It’s one of our favorite parts of LUNA Fête,” Glatz said. “Artists come to us with ideas, and we help them gain the skills they need to execute their vision in time for the fest.” And when the Arts Council saw opportunities for projection mapping pop up in other cities, they decided to hold trainings so more local artists could compete. They trained 90 artists this year, alone. 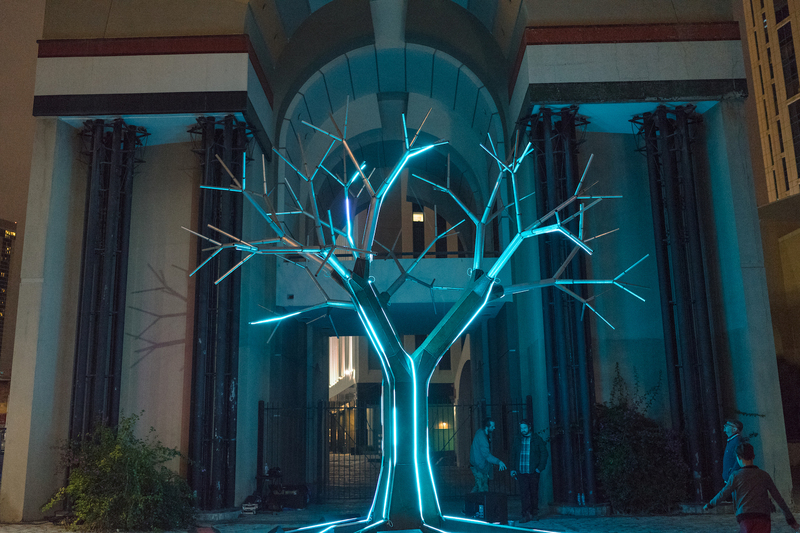 Last year, with NOLA artists ahead of the curve in light-related artwork, the Arts Council was able to send several local artists to Napa, California to assist with their festivals. These mass trainings also help artists find work locally. One artist who specialized for years in two-dimensional paintings earned a job designing artwork that incorporated lighting at the front of Aloft Hotel on Baronne Street. Auction House Market has also reached out to the Arts Council in search of artists to help them incorporate lighting that can make the outside of their food hall more appealing. And, of course, it provides more qualified local artists to choose from when it comes time to put together another LUNA Fête. “When we began in 2014, none of our artists were local. We didn’t have the skills yet. This year, 95 percent will be from the region,” Glatz said. Editor’s Note: LUNA Fête is a fundraiser for the Arts Council. Patrons can donate by buying a LUNA Lounge ticket, buying a shirt or a balloon at the festival, or making contributions at LUNA Fête.